If you like my entry, you can vote for me through this page. The prize is the entire OPI Nicki Minaj collection, plus an autographed copy of her Pink Friday album! Isn't that awesome?! I'm thrilled about the whole prize, so I'd appreciate it if you truly want to vote for my entry, though that's entirely up to you of course! Did you participate in OPI's Nails 4 Life contest? Awesome design! I voted for you :) Good luck! if i had fb i would vote for u i love this it is sooo adorable! very well done i might add.. I voted for you, this is awesome! These are amazing! I voted for you! Amazing! I love this graffiti style! This is so, so amazing! I voted! Good luck I hope you win! Voted, you should totally win! ¡Qué manicura más orginal y llamativa! Y muy, muy trabajada. you've got my vote! i love your creations! These look fantastic! Good luck on the contest! Damn, that is so well done! So amazing! This turned out really great! I love the accent finger! Holy! That is amazing. My jaws dropped when I saw the picture. Hey Girl! I don't know how to send you a private message, but I guess this would be the best place to get you! Just letting you know OPI's official guidelines say you can't post your entry in public. Just letting you know now so you don't get disqualified!!!! Your nails are HOT! Not sure if you know me, but this is Algae Veronica. Beyond amazing! I love these. I LOVE YOUR BLOG AND NAIL DESIGNS. it has inspired me in so many ways, to start my own blog, and just to love my nails more. this design is fab, i will vote for it! 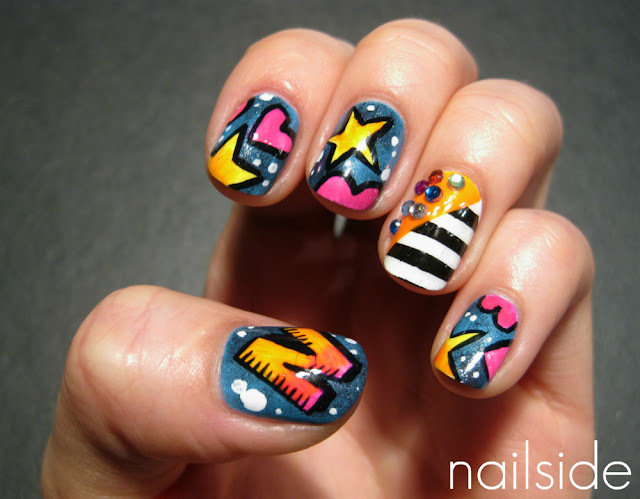 Love these nails! You've got my vote! Amaazingly cool!! This just rocks! OK those are the most perfect nails ever! Your seriously talented! I did not participate, but I hope you win!! Thanks so much for your support everyone! :-* I didn't expect so many lovely comments as I wasn't completely satisfied with the entry myself. @Algae Veronica and Anonymous: Algae Veronice, of course I know you! I came across your work on Tumblr. 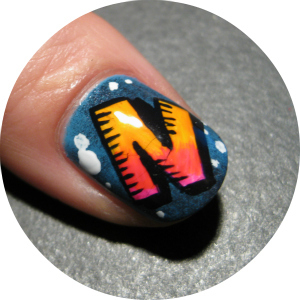 You've got an awesome funky style :-) And about the OPI contest: thanks for warning me both, I really appreciate it. I've been really confused though about if I was breaking rules or not. OPI says the entry "cannot have been submitted previously in a promotion or contest of any kind or exhibited or displayed publicly through any means". I assumed that was just to avoid having contestants using an old manicure for the contest. Also now that voting has started, OPI is expecting contestants to share their entries via Facebook to gain votes, which is public too right? So after a lot of thinking I decided to leave this post on my blog because I don't believe I'm breaking rules. And if I was, removing the post wouldn't undo it as I've already gained votes with it. (It's not looking very well though, looks like I'll have to buy the Nicki Minaj collection myself! ;-)) But thanks again for the notice, even when you're in the contest yourself! They look really fab! Good luck! These are awesome! Please make a tutorial for these! I want to do them, too!!!! Wow these are the coolest and cutest and most awesome nails I hope you won!